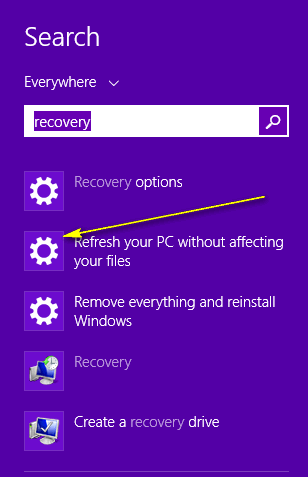 I think one of the best features of Windows 8x is one I hope I never have to use: it’s called “System Refresh”. And before you get it in your noggin that System Refresh is just a newer version of System Restore, it’s not. All of us who have reinstalled Windows knows, it’s one of the few ways you can get back the new computer feeling. The only problem with reinstalling Windows is that you’ll lose all you programs, settings, files, and data – unless you have them backed up. And unless you have a image backup it’s not practical to backup programs because of the registry entries and dependencies. So most of us consider reinstalling Windows a last resort. Windows 8 changes all that. A Refresh in Windows 8 is a re-installation of Windows while keeping your files, settings, data, and apps in place. However — and this is a big however — you will lose any programs you’ve installed from the Web or from DVD/CD/USB. You don’t need a Windows disk to do a refresh — all you need to do is run a System Refresh. Press and hold down the Windows key and press the C key to open the Charms bar, click on the search icon (it looks like a magnifying glass) and type in “Recovery” (without the quotes). choose “Refresh your PC without affecting your files” from the list. System Refresh, when it starts, runs from the Windows 8 recovery console, Windows will keep all your files, folders, settings, data and apps, aside — while it re-install Windows. After Windows has re-installed, and while you’re still in recovery mode, all your apps, data, settings and so forth will be restored— and a list of programs you’ve installed from the Web or from disks or USB will be left on your desktop so you can re-install them. When you’re all done, you have a freshly installed copy of Windows 8 and you’ve lost only programs you’ve installed. All the Windows Apps you’ve installed from The Windows Store will be re installed for you during the last phase of the System Refresh. To learn how to do a System Reset, visit this page. 1. What is the “recovery console” ? My system has NO restore partition. 2. I’ve upgraded to Win 8 Pro and then to Win 8.1 Pro update 1. My question is: after the refresh, what Windows will I have? The original Win 8 home? Win 8 Pro? Win 8.1 Pro?